Many people who browse the freezer section of their local grocery store may find themselves wondering, "What is the difference between gelato and ice cream?" It's a good question. The two frozen treats look remarkably similar, and many wonder if the difference between gelato and ice cream is that one is ice cream, and the other is merely the word ice cream spoken in Italian. Believe it or not, there are a large number of differences between the two, aside from the names. There are actually a large number of things that illustrate the difference between gelato and ice cream. Gelato is more richly flavored and typically has a higher flavor concentration than ice cream. Ice cream has a higher cream to whole milk ratio than gelato, which results in a higher fat content. By law, ice cream has a minimum of 10% fat while gelato traditionally has about 6% fat. Gelato has less air whipped into it than ice cream, which can result in a denser dessert. It has about 25% air while ice cream can be as high as 50%. The churning speed of gelato is much slower than that of ice cream. Gelato is served slightly warmer than ice cream, which results in a softer substance. There is typically about a 15 degree difference between the serving temperature of ice cream and the serving temperature of gelato. This gives gelato a consistency that is much closer to soft serve ice cream. Gelato typically has more egg yolks than most ice cream does. Gelato melts more quickly than ice cream. There are two reasons for this. First, the lower serving temperature of gelato has it closer to its liquid state from the outset. The second reason that gelato melts more quickly than ice cream is that it has a lower fat content. Ice cream is easier to get those perfect, round scoops. This is in large part because of the amount of air that is whipped into the frozen treat during production. Gelato, on the other hand, is denser and not as easy to make those perfect, pretty, rounded scoops. Italian ices are considered to be a type of gelato in Italy. In this regard, the difference is notable. Italian ices are water and fruit based rather than dairy based, as ice cream is. The ingredients used in flavoring ice cream and gelato are often different. Gelato tends to be made with nuts, chocolate, natural flavorings and fruits while ice cream is often made with syrups and artificial flavorings. 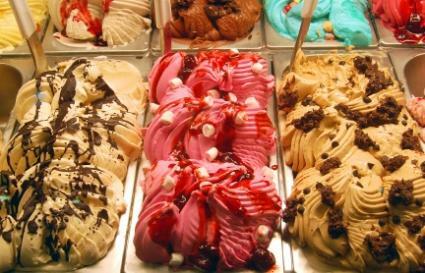 Gelato also may be likely to have more unusual flavor profiles - like lavender, avocado, and olive oil flavored gelato. Gelato is often served topped with fresh fruits, chopped nuts or things like cocoa powder, while ice cream is typically served topped with syrups - or not topped at all. The appearance of gelato in a serving container looks more like whipped cream or soft serve ice cream that has been carefully piped into the container. Why is Gelato More Intensely Flavored? The flavor of gelato is more concentrated because of a combination of the above factors. With less fat to coat the tongue, the mouth is more receptive to taste, which gives the illusion of a more intense flavor. The fact that gelato has so much less air in it than ice cream also allows for the intensity of the flavors to be more concentrated in the gelato. Just like homemade ice cream tastes different than commercially available ice creams, so will homemade gelato. Gelato made at home in a traditional ice cream freezer typically winds up with more air incorporated into it than a traditional commercial gelato, so the flavor intensity winds up being slightly less than you might experience with a commercial gelato. There are home gelato machines available that whip the gelato at the proper speed, so if you are looking for an authentic gelato experience, you may wish to purchase one. Of course, ice cream and gelato also share a number of things in common. They are both dairy-based frozen desserts. A traditional method of serving both is in a cone. They are both really delicious frozen treats that can brighten up even the darkest of days.